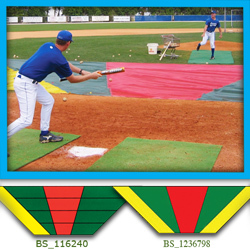 Bunt Zone infield protector-trainer with color-coded bunting/hitting targets built-in. Saves turf & teaches by visualization the correct placement of bunts for hit (yellow) or sacrifice (green). Avoid red area for bunting, hit-and-run, and pull-hitting, but go to it for up-the middle hitting. Highly spike-tolerant 9 oz. industrial vinyl-polyester mesh with UV and mildew inhibitors. Fusion welded seams and full perimeter, double stitched, webbing-reinforced hem with ten standard grommets installed. Sizes available : Small: 15' x 18' x 48'. Ground Stakes Recommended - 11 for Minor League. Medium: 15' Deep x 24' x 54'; Ground Stakes Recommended- 11 for minor league. Large: 20' Deep x 24' x 64'. Ground Stakes recommended, 11 for minor leage. NOTE: Minor League Style Bunt Zone Protector has a yellow "Bunt-for-a-hit" zone up the third base line ONLY. * Major League Style Bunt Zone Protector has yellow "Bunt-for-a-hit" zone up BOTH first & third base lines.